Ravi Naimpally (tabla, darbuka), Alan Hetherington (drums, percussion), Ernie Tollar (flutes, saxophones), John Gzowski (guitars, oud), and Chris Gartner (bass). With guests: Yair Dalal (oud, violin); Christian Dawid (clarinet, bass clarinet, bell flute); Dhruba Ghosh (sarangi); Anwar Khurshid (sitar); Julien Labro (accordion); Hugh Marsh (violin); Roula Said (qanun); Eric Stein (mandolin); Kevin Turcotte (trumpet). 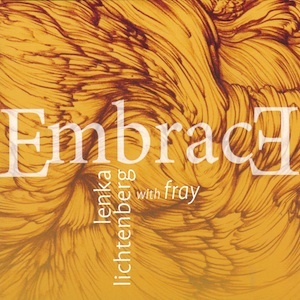 Embrace is the energetic, bold second release of the Canadian world-music group, Fray (“free” in Yiddish) – headlined by the multi-faceted, award-winning international recording artist, Lenka Lichtenberg: composer, vocalist and songwriter. Continuing in the tradition of Fray’s eponymous debut album, Embrace boldly forges uncharted terrain with unexpected sounds from Middle Eastern, Brazilian and North Indian music, expertly animated by Canada’s leading Indo-Canadian and world-jazz players. 11 songs (5 in English, 5 in Yiddish, 1 in Hebrew) that embrace a soulful, harmonious and stirring mix of East and West.